Next is Claire Weustenraed who currently lives in London and joined us in Morocco last fall. Claire is one of those people who bursts with enthusiasm for just about everything, and her energy is infectious! Though relatively new to running when we met her, she dove in headfirst and set a personal weekly distance record on our trip (no matter that it was the most challenging terrain she'd ever attempted), and she has continued to push her limits with a newfound love of mountain running. I started running around the end of November 2015 after moving back to Europe from Asia. Friends convinced me to join a social trail run with North Face (10km) and from there on I was hooked! I then joined the AdventRunning December run streak where I met great people who inspired me even more. Seems like since then I never looked back, and running is now a part of my life. I was looking for a run-holiday and Rogue Expeditions popped up on Google. With Frostie [Anna Frost] being a run leader on the trip I was sold! I didn’t know anyone on the trip, but Rogue Expenditions made me feel welcome from the first minute I stepped foot in Morocco .. super friendly bunch of crazy badasses! My favourite run - that’s a really difficult question. Every run was great and different .. run in the rain / sun / more flattish … crossing rivers … running up and down .. and always supported by the team of running friends and the lovely drivers who carried water and super food snacks! Food is a huge part of any travel experience. What was your favourite thing that you ate? Really, I don’t know where to start .. the Rogue Expeditions cooks are AMAZING !!! Every single meal, every single dish is just like heaven on earth … I loved it ALL !!! No issues at all as it all is soo well organized by Rogue The heat sometimes wasn’t easy, but then again our lovely drivers were there with water whenever you needed it and there is always someone who waits for you to help you to finish together. 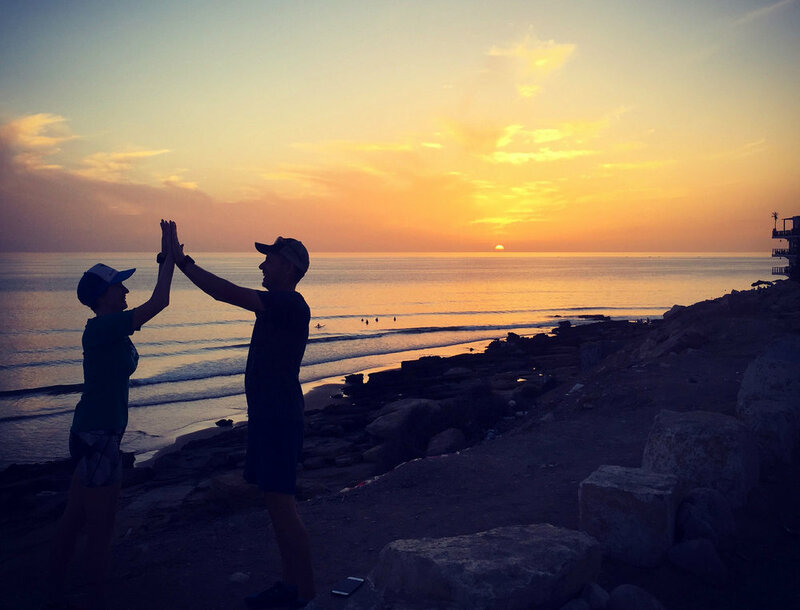 Claire and Joel finish sunset bonus miles on the last night in Morocco, wrapping up a personal weekly distance record (100km!) for Claire! I don’t think its comparable. It's a different mind set .. different vibes … I learned soo much on this trip about mind-over-body, food and rest. I’m seriously thinking on taking another trip … Allison and Gabe are just … AWESOME !!! They made me feel welcome and they are such great runners. They take the time to talk to you, listen to your experiences and always help you to push your limits. Since my Morocco trip I’ve run 2 mountain races (Spain and Italy) and I couldn’t have done it without them as the runaction gave me so much confidence. Oh and I met some great friends on this trip!